Y’know, I always suspected my toys were coming to life when I wasn’t looking! In TOY STORY, young Andy’s toys lead lives of noisy desperation come every birthday and Christmas – no one wants to be one-upped by a new addition to the toy box. Led by Cowboy Woody (there’s a BROKEBACK joke just waiting to happen), Mr. Potato Head, Rex the Dinosaur, Ham the piggybank, Bo Peep, Slinky the dog and a smattering of other playthings go about their toyish business of playing checkers, hanging around Andy’s room, and “plastic corrosion awareness meetings,” until Andy’s birthday party, when they gather expectantly around a transistor radio, listening to the reports of their toy soldier troops “in the field” (downstairs watching Andy’s gift-opening), hoping that no gift will be exciting enough to cause Andy to neglect them. There is. His name is Buzz Lightyear, Space Ranger. 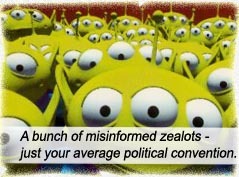 Directed by Pixar mainstay John Lasseter, with the voice talents of Tom Hanks as Woody, Don Rickles, John Ratzenberger (forever Cliff from CHEERS), R. Lee Ermey, Annie Potts, Jim Varney and Tim Allen as Buzz (“To Infinity and Beyond!”), TOY STORY is that rara avis that succeeds on all levels – animation, storyline, character development, messages of friendship and self-realization and, most importantly, entertainment value. The fact this is a cartoon (the “first ever computer-animated feature” – just what DO we call this new wave of 3D cartoons?) is incidental. The slightly dodgy animation of the “real people” is irrelevant; TOY STORY gets the point across with or without technological finesse. The “Disney Movie” has become synonymous with maudlin messages, redneck fundamentalism, anachronistic family values, boneheaded parents, smart-mouthing youngsters, too-hip-to-be-smart teens and insufferable pets. Though Disney’s tyrannical umbrella overarches this film’s production studio, Pixar Animation, TOY STORY somehow avoided all trace of Disney’s craven hand. It becomes doubly surprising when we consider this is Pixar’s first feature length film after years of experimentation. Right outa the gate and right outa the field. Sure, there are “messages,” but they are heartfelt, rather than maudlin (Woody tells Buzz during Buzz’s greatest depression that it matters not what Buzz thinks of himself, what makes him important is what his owner, Andy, thinks of him); there are emotional segments, which are truly heartbreaking, rather than cheesy (when Buzz’s escape attempt lands him with a broken arm, proving he is Not A Flying Toy, the lyric, “Clearly I will go sailing no more,” launches a thousand hankies). And the portrayal of Andy’s family is Pixar’s triumphal achievement – boldly contravening Disney’s idée fixé of the 1950’s nuclear family and Norman Rockwell fantasies, one of the many incarnations of a modern family is presented: a single mother with two kids, who are neither geniuses nor monsters, just normal children, happy to visit Pizza Planet and disappointed when favorite toys are lost. Buzz – who believes he is a real life space ranger on a mission to save the universe – becomes Andy’s favorite toy over Woody. The amusing thing is: though Buzz believes he is real, he still adheres to toy protocol of “playing inert” when humans are in the area. When he mentions saving a toy from Sid, the vicious boy next door, how does he propose to do it while adhering to the inert protocol? 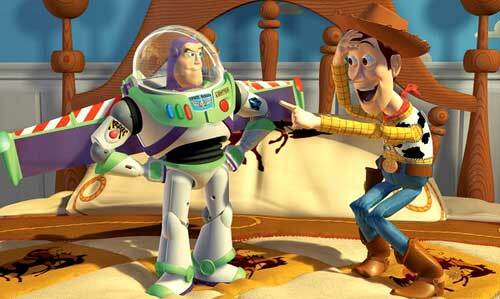 Buzz’s ingenuousness regarding his toy role infuriates Woody to the point of attempted toy-assassination. Through a concatenation of accidents, both he and Buzz become lost and must use teamwork, trust and ingenuity to beat their path back to Andy, which finds them ensconced in scorchingly funny vignettes (Buzz fastening himself in an oversized seatbelt; Buzz and Woody falling in with green, three-eyed alien toys who regard them as gods; Buzz hyperventilating as “Mrs. Nesbitt”). During a climactic rocket ride, the callback line, “This is not flying – this is falling with style,” seals this movie’s greatness. At least I now have a plausible explanation as to why my toys always got lost: after going about their toy business, they would just go inert anywhere they happened to be, instead of paying attention to their master’s infallible toy filing system…. Writers: John Lasseter, Peter Docter, Andrew Stanton, Joe Ranft, Joss Whedon, Joel Cohen, Alec Sokolow. Starring: Tom Hanks, Tim Allen, Jim Varney, R. Lee Ermey, Annie Potts, Wallace Shawn, John Morris, Erik von Detten.